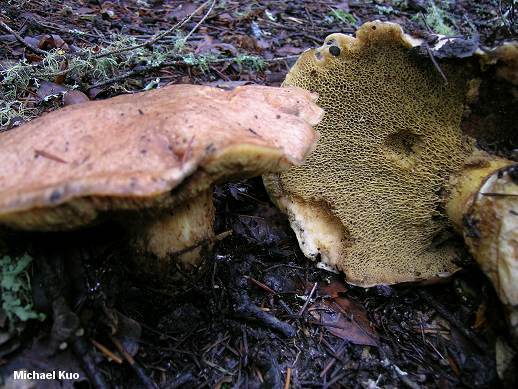 This messy Suillus is a mycorrhizal associate of Douglas-fir in western North America. 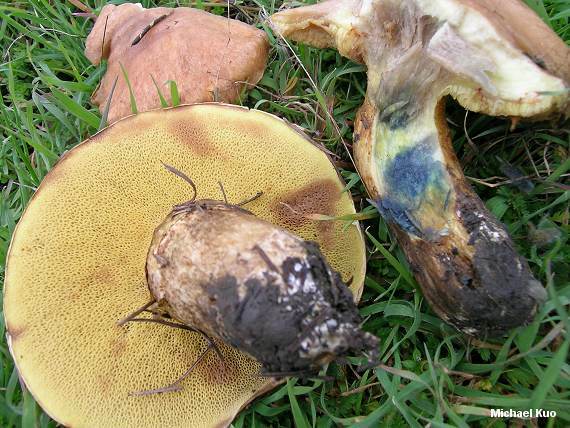 It seems as though it ought to be easily distinguished; the flesh in its stem turns blue on exposure (rare in species of Suillus), and its pore surface slowly bruises a distinctive reddish clay color. Suillus imitatus has a cap that is "glabrous or practically so, if fibrillose-streaked the fibrils beneath the gluten" (Smith & Thiers, 1964). It also has a slimy, yellowish partial veil, and slightly shorter spores (7-9 µ long). Suillus imitatus var. viridescens develops greenish to olive or bluish shades on the cap surface. Ecology: Mycorrhizal with Douglas-fir and other conifers; growing alone or gregariously; fall and winter; western North America. Cap: 6-14 cm; convex becoming broadly convex or flat; moist or fairly slimy; smooth or with patches of appressed fibers or scales; yellowish brown to tawny or cinnamon brown; the margin sometimes hung with partial veil remnants. Pore Surface: Yellowish; bruising slowly reddish brown; pores angular and radially arranged (but not boletinoid), about 1-2 mm across; tubes to about 1 cm deep. Stem: 3-8 cm long; 2-3 cm thick; more or less equal, or tapered in either direction; solid; often finely reticulate near the apex; smooth or with appressed hairs; lacking glandular dots; yellowish above, dingy to brownish below; bruising brown; with a whitish, dry ring that soon collapses or disappears entirely. Flesh: Pale yellow; staining blue in the stem base when exposed, elsewhere not staining or staining pinkish to brownish. Odor and Taste: Mild or slightly acidic. Chemical Reactions: Ammonia grayish on cap; pale grayish lilac on flesh. KOH olive gray becoming dark gray on cap; dark gray on flesh. Iron salts olive on cap; olive to bluish on flesh. Microscopic Features: Spores 8-11 x 3-5 µ; smooth; subfusoid. REFERENCES: Smith & Thiers, 1964. (Smith & Thiers, 1964; Thiers, 1975; Smith, Smith & Weber, 1981; Arora, 1986; Phillips, 1991/2005; Lincoff, 1992; Both, 1993; Bessette, Roody & Bessette, 2000.) Herb. Kuo 01130517.